Proform Pro 1000 Treadmill is a product that merges ease-of-use and technical superiority. So, if you like to give your legs more burn; this is the product to check out. Are you interested in giving your legs the best possible workout while using a treadmill? Then this product will work best for you. Reasonably priced with exciting features, Proform Pro 1000 is a good buy. If you want to save evern more, you can check out the Pre-owned and Open-Box product promotions and special offers available at many sellers online. The special feature of Proform Pro 1000 is the 12% Incline training provision. This product also has the iFit technology that you can access from your smartphone or tablet. Of course, the membership is sold separately. The built-in tablet holder will keep you entertained and updated as you can check fitness apps and watch your favorite television shows while using the treadmill. The 3.0 CHP Mach Z commercial motors on these products stay cool even during the toughest workouts. You will also accomplish a quiet in-home workout and powerful and smooth feel. The motor has a lifetime warranty that will provide you a no-stress buying experience. If you are particular in getting a comfortable run, this product’s ProShox cushioning will provide you that comfort. The cushioning is provided throughout the deck area. Therefore, when you run, walk, or jog your joints will not suffer and enjoy a longer time for workout and faster revival period. The space saver design and the easy lift assist feature of this treadmill will fit any size of house or room. If you are not using the machine, you can easily fold it up and store inside your house without occupying much space. Only with one push, you can lift the deck with ease provided by the built-in powerful shock. A roomy deck is provided by the design of ProForm. Your legs will have plenty of space with the 60-inch length and your upper body will have plenty of elbowroon with the 20-inch width of of this treadmill. Instant access to 22 workout apps and ready to go professional training programs are provided to you as soon as you step aboard this treadmill. All you need to do is to press “Start” and you are all set. No need to worry about your heart beat as you can monitor it with the EKG heart rate monitor built in to the two handlebars. You are able to check your heart rate at any time during your training. Your workout statistics are easily seen in front of you during your workout. It is always good to know how your speed, mileage, calorie burn, heart rate, and time add up improves during your training period. Top speed of 22 MPH is achievable with this product. The total weight of this treadmill is 350 pounds and the dimensions are as follows: 77L x 39W c 70H. 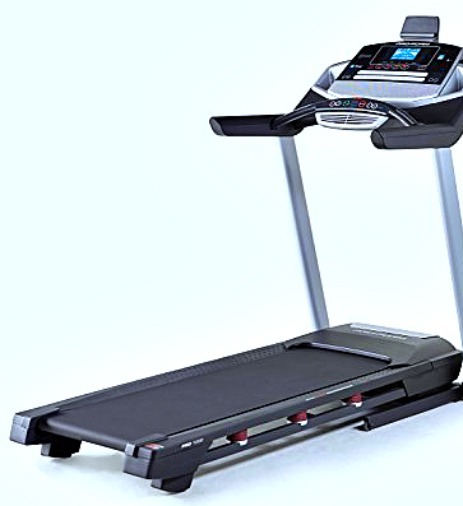 The manufacturer also provides a warranty and guarantee for this treadmill. No doubt according to many users, this is one of the best treadmills in the market. However, there are some customers that had difficulty with the manufacturer’s customer service and installation procedures. Repair to a few is also an issue. The best cushioning with the ProShox is one of the strongest feature of this product. The spacious deck and easy handling are also plus factors for this treadmill. If you intend to workout for longer period, then this product is best as the motor does not heat up. Proform Pro 1000 Treadmills combine easy usage and technical excellence for its remarkable features. So, if you like comfort combined with durability and technology, this is the product for you. But, if you are still not satisfied with this product, there are a lot more… (See our best recommended treadmill page).